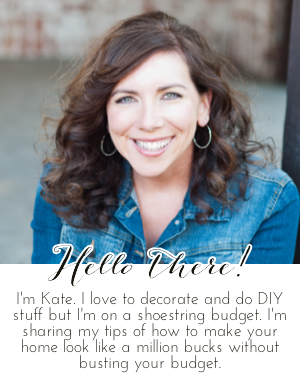 Chic on a Shoestring Decorating: Flaunt it Friday 344! We are having unseasonably warm weather here and I've started into spring cleaning mode even though it's only February! I mean, I clean... Every. Single. Day. But, I haven't deep cleaned or organized anything yet. Mr.Chic and I've started painting. Once you start painting you realize how bad you really needed to paint. We painted every wall (literally) when we moved here seven and a half years ago with a baby and a toddler. As you can imagine, anything that hasn't been repainted since then definitely needs painting. Once you paint one thing it is a very slippery slope of realizing your paint looks like crap. We painted our kitchen cabinets white (YAY!) I used this fine finish foam roller which gave a really nice finish, no brush strokes, but that's for another post! Anyway, painting our cabinets white made our crown molding look dirty, we painted the crown too. While painting the kick plate of the cabinets I realize that my baseboards were not only dirty but really banged up from several years of match box cars being crashed into them over and over again. I painted the trim which eventually led over to my basement door and realized it looked disgusting. Besides being dirty it was really banged up so I painted that and the trim around it too. I even painted the interior of my front door and door to the garage! So, I'm pretty sick of painting and I haven't even painted any walls yet. ;) I will share some pictures in a post once I get everything cleaned up. Since all I've been doing is painting my house is pretty much a disaster. Still have a few touch ups to make so I'm off! TGIF! Have you started any spring cleaning/painting/organizing yet? Thank you Kate for your 344th Flaunt It Friday, appreciated. It's been warm here too but I'm still hoping for some cold weather. I need an excuse for not deep cleaning the house, lol. Thanks for hosting and have a great weekend!